Vegetables – Don't Forget the Cream! As the days grow warmer, longer and sunnier, the excitement of summer consumes us. We change our wardrobes, our hair styles, and our habits. We ride a bike instead of driving, we exercise more, or we at least consider the possibility, school ends, vacation plans are realized and….our gardens grow. We plant, harvest, and enjoy, or we visit a farmers market. If no other options are open to us, we at least buy fresh vegetables from the market. So, the other night we had a deck picnic of spiced chicken with white bar-b-que sauce, baked potato skins and corn on the cob. 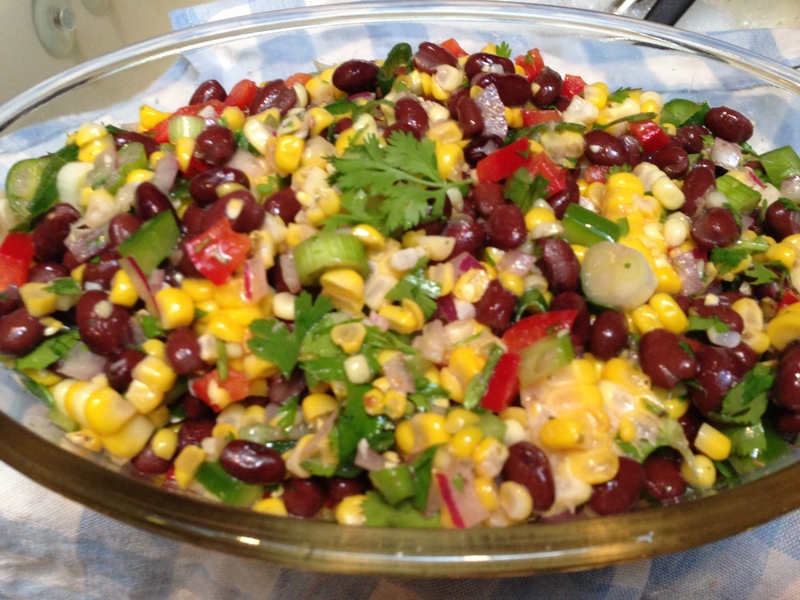 A few ears of corn were left over, so the following day we had this Summer Corn Salad. This is my recipe, but really it can be considered an opinion and modified as you like to suit your meal and tastes. It is better if the flavors can melt for at least 2 hours in the refrigerator before serving, but if you don’t have the time, it is still tasty. 1 can of black beans, drained and well-rinsed. Allow to drain. **Optional: Chopped jalepeno to add heat. 1. Chop and mix together the vegetables and beans. 2. In a measuring cup, whisk together the oil, red wine vinegar, champagne vinegar, sugar, oregano salt and pepper. Taste the dressing. At this point you may want to make adjustments. Our family enjoys the bite of vinegar, but if you prefer a milder dressing, add a bit of water and/or sugar until you find a flavor you enjoy. Remember, the vegetables will reduce the height of the flavor by imparting their own. Mix the dressing into the vegetables and beans. Once fully coated, mix in the chopped cilantro and chill for at least 2 hours.